A thorough introduction to the Japanese martial way of the sword, Complete Kendo covers every aspect of the discipline, from equipment and terminology to technique and strategy. 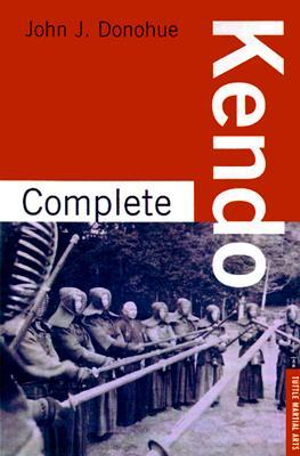 Complete Kendo is a thorough introduction to the Japanese martial way of the sword and a guided tour of the principles and philosophy upon which the art is founded. John Donohue covers everything from the care and handling of hakama, the pleated trousers worn by kendoka (practitioners of kendo), to the methods of cultivating the meditative state of mushin (no mind), all in an easy conversational dialogue that is a great pleasure to read. Structured to echo the organization of the Book of Five Rings by Miyamoto Musashi, this kendo book is a modern version of the swordsman’s primer by a martial artist skilled not only in the art of kendo but, like Musashi, in many traditional Japanese martial arts, and with a superb understanding of the martial tradition and culture of Japan. The author uses lessons learned from a long career of teaching martial arts and academic subjects to impart clearly and concisely the fundamentals of kendo and the martial way. With explanatory line drawings by Kathleen Sweeney illustrating significant points of discussion, kendo katas, a handy glossary of kendo terminology and related concepts, and an unusually helpful bibliography, Complete Kendo is an essential volume for every kendoka’s personal library.